During the eighteenth century, there were great improvements in agriculture, spurred on by the industrial revolution and the demand for more food from the growing industrial towns. In the Weald, much of the land was woodland or pasture but more was brought under the plough for growing corn during the century and consequently more mills were needed for grinding the corn into flour. There were several water-mills within the parish boundaries although the streams were mostly small, but the outbreak of war with Napoleon in 1793 meant an increased demand for supplies for the army and navy. Thus the next 20 years were a prosperous time for farmers and millers. The 1801 Ordnance survey map shows only one windmill on Cranbrook Common (near Camden Lodge), but another was built further north in 1802 (north of Verralls garage). Perhaps their success inspired two more windmills to be built in 1814, one near to Three Chimneys (close to the parish boundary with Biddenden) and the other on the Hill, at the east end of the town. William Dobell was a tallow chandler, living on the Hill in Cranbrook in the late 18th century. He married his second wife, Mary Couchman in Benenden on 25th October 1788 (1) but died relatively young and was buried on 7th April 1799 (2). Mary must have been moderately well off as William had left her a tenanted farm on the Golford Road (now called "Paddocks") and houses and land on the Hill in Cranbrook, which included the house near the windmill now called "Greycoats" (3). They had four children, of whom Henry, born in 1791, was the second and Stephen was the third (4). Mary continued the tallow-chandler's business, going into partnership with her son Stephen (5) and built the windmill for Henry (6), who, presumably, had been apprenticed with a miller in the neighbourhood. The mill was first rated in her name in April 1815 with a rateable value of £15 but Henry took over as ratepayer in May 1816 (7). Henry must have felt that his future was assured and he married Susannah Boulden on 17th June 1816 in St.Dunstan's church, Cranbrook. In November 1818 the rateable value was increased to £20 but there is no rate assessment for the Dobell property in May 1819 and by the Autumn bankruptcy had been declared. The rate books give "Henry Dobell or occupier" in November but the rate was probably never paid. The slump which followed the end of the Napoleonic Wars hit agriculture badly and there was a nation-wide depression which lasted for at least a decade with reduced wages, much unemployment and great hardship in the countryside, resulting in the Swing Riots of 1832. The Centre for Kentish Studies in Maidstone holds a deed (6) dated 11th Oct 1819 which is a copy of the conveyance and assignment of Mary Dobell's real and personal estates to three Cranbrook trustees, James Russell, gent, James Skinner, gent and Thomas Oyler, carpenter. James Skinner was the minister (from 1785 until his death in 1827) of the Chapel-on-the-Hill, which the Dobells attended and in whose registers the births of William and Mary's four children were recorded in the 1790s. The Dobell properties are listed in this conveyance and they include the windmill described as follows: "a wind cornmill ... lately now erected and built by and at the costs and charges of the said Mary Dobell ... at a place called the Hill in Cranbrook now occupied by Mary Dobell". In addition to the land and buildings, Mary Dobell was obliged to sell "all stock in trade, stock alive and dead, farm implements and effects whatsoever and wheresoever ... And all the Household Furniture, Plate, Linen and China Goods, Wares, Merchandizes, Book and other Debts, Bills, Notes, and Securities” and all her goods and chattels “except her wearing apparrel”. So all she was left with was her clothes. The deed cites three outstanding mortgages of £1000, £600, and £600 with interest, having first call on the proceeds from the sale of the property; no names of the mortgagees are given but presumably they were the three trustees mentioned above since they had the most to lose and it seems likely that the money was borrowed from them to pay for the construction of the windmill and a cottage nearby (see later). The three trustees inserted notices in the Maidstone Journal shortly after (5), requesting claims from any creditors of Mary Dobell. There was also a notice announcing the dissolving of the partnership of Mrs Mary Dobell and Stephen Dobell, tallow chandlers, presumably to protect Stephen's personal estate from claims when settling Mary's debts. It is interesting to note that one of the witnesses to this declaration is James Humphreys, the millwright who built the windmill for Mary. Then came the advertisements for the auction of Mary's real estate, the farm, and the cottages on the Hill, although it did not include the windmill (first two lots only included). Under a Deed of Assignment for the Benefit of Creditors on MONDAY, NOV 29th inst at two o’clock in the afternoon. at the GEORGE INN, CRANBROOK. The following very Valuable and most Desirable FREEHOLD ESTATE late the property of MRS MARY DOBELL, Tallow Chandler, &c. Cranbrook. LOT 1. Consists of a DWELLING HOUSE, SHOP, Outbuildings, Yard, Garden, Stable, &c. and THREE newly-erected COTTAGES, situate on the HILL, adjoining the town, on the road to Tenterden. This lot is well worth the attention of Tallow Chandlers wishing to obtain an established business, the neighbourhood being very populous, consequently capable of very great extension of trade. LOT 2. TWO DWELLING HOUSES, adjoining lot 1, in the several occupations of Mr Henry Dobell, Slopseller, &c. and Samuel Relf. Henry's reduced circumstances had obliged him to find other less desirable employment. There is no separate advertisement for the sale of the windmill although it is possible that it was advertised with no location details; there were several advertisements for windmills in the Maidstone Journal in the ensuing year (eg two on 20th April 1820 in Kingsdown and Snodland). It seems more likely that the trustees decided that they would not obtain a worthwhile price in the economic climate and did not advertise the mill for sale but decided to recoup their money by approaching local people to operate the mill, which was little more than five years old. 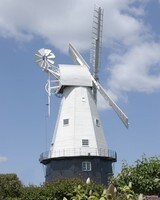 The windmill was not rated again until December 1820 to "Buss & others or occupier" at a rateable value of £20. Pigot's 1824 trade directory describes William Buss as a corn factor (and in 1829 as a hop factor). He was also a partner in the Cranbrook Bank and therefore a suitable person for the creditors to appoint as a trustee to oversee the management of the mill and generate some income. Certainly, the name "Union Mill" had been adopted by 1822 but entries in the rate books suggest that the Trustees for the Creditors changed fairly often (or perhaps just the chairman). From Dec 1822 - Apr 1824 the occupiers wer given as "Saml Reader & others" while from Jul 1825 - Jan 1829 they were "Isaac Titford & Co"
Pigot's directories tell us that Samuel Reader was a printer, bookseller and librarian, while Isaac Titford was a druggist, ie chemist, so they were presumably the chairmen of a group of parishioners who constituted the trustees of the Union Mill Company and oversaw the management of the mill's affairs. Samuel Reader died in August 1824, which prompted the trustees to advertise the mill for sale again but presumably no-one was prepared to pay a satisfactory price. No record has so far come to light to tell us who was actually working in the mill, making flour from grain during this period, although Stephen Dunk, another Cranbrook corn factor, is described as "manager for the Union Mill Company" in Pigot's directory published for 1828-9, so he probably organised the deliveries of grain to the mill and flour to the customers, along with all the contingent paperwork, and reported progress to the trustees on a regular basis. At the George Inn, Cranbrook, by order of the devisees IN TRUST, under the will of the late Mr. WM. BUSS, deceased. Lot 3. A substantial modern-built WINDMILL, advantageously situated near the town of Cranbrook, with a Cottage , in two dwellings, and about an Acre of Ground adjoining. The Mill contains 7 floors, 3 pairs of stones, (1 pair 4 ft. 6 in. French, 1 pair 4 feet 4 inches ditto, and 1 pair 4 feet 6 inches peak.) Flour Machine, Bolter, Jogging Screen and Gear complete. The ground floor, with the first and second stories, are enclosed with solid brick-work, and form capacious store-rooms; with a convenient counting house. The jogging screen was used to clean the grain before milling by sieving out any stalks, chaff, and foreign matter. French burr stones are used in mills when white flour is required, as the bran, the outer "skin" of the grain, is not ground so finely as by peak stones. Consequently, when the wholemeal flour produced by these millstones is passed through the bolter or the flour machine to produce white flour, its removal is much easier. The Union Mill Company was still recorded as the ratepayer in June 1832 but by the following October, the sale had been concluded and John & George Russell, from Waldron and Chiddingly in Sussex, were the new owners and paid the rates. After starting his working life with such high hopes, Henry must have died a greatly disappointed man.